How do I fix my kneecap pain? 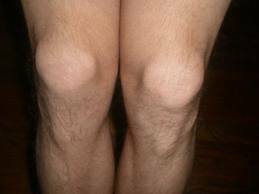 Two things are necessary to treat chondromalacia patella. When the knees are hurting, quite a good reduction in pain can usually be achieved within a fortnight by working the weak inside muscle called Vastus Medialis. There are two mechanisms that do this. Firstly, some improvement comes from strengthening the muscle but the second, and likely greater effect, comes from ‘waking up’ the Vastus Medialis muscle and reminding it that it has a function to perform. After what might have been decades of being underutilised, VM will often be ‘turned off’ and not participating in the functions of walking and running as it should. To exercise VM, avoid doing heavy knee extensions like one might do on machines at the gym. These big movements will need the strong muscle to do the work, causing it to get stronger still. The correct exercise to best work Vastus Medialis in preference over Vastus Lateralis is a very subtle one but is also very easy to do. At the podiatry examination, presuming this is what is required for you, you will be shown exactly how to perform it. In the longer term, in shoe inserts called orthotics are usually required to control the amount and rate of internal rotation that the leg can do over the top of the foot. This rotation is somewhat difficult to control, and needs quite a potent and therefore specific and well crafted orthotic. One-size-fits-all orthotic insoles from sport shops or chemists are not suitable to control this motion as they generally lack the rigidity at the inside aspect of the rearfoot to effectively stop motion. For more information about foot related knee pain in one cohesive document, please browse to our Kneecap Pain Info Sheet. Alternately, use this link to return to our Podiatry FAQs Blog.